We all know how easy and convenient shopping online is. But did you know there’s a way to make it even more gratifying? And it requires nearly zero effort on your part. 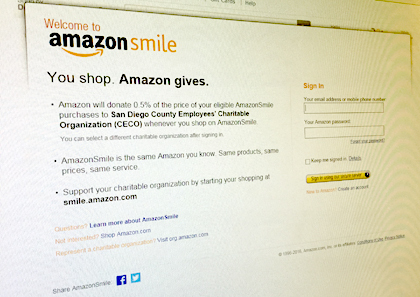 Shop AmazonSmile and a portion of your purchase will be donated to the San Diego County Employees’ Charitable Organization (CECO). You can support CECO and their 60th anniversary efforts when you shop on Black Friday and Cyber Monday (and, really, year-round). AmazonSmile functions the same as Amazon, but the online retailer donates 0.5 percent of the product price of eligible purchases to a charity of your choice (read: CECO!). Go to smile.amazon.com (different from the regular Amazon link). If it is your first visit, pick your own charitable organization. Type “San Diego County Employees' Charitable Organization” or “CECO” as your charity. You can also visit this link and CECO will already be chosen for you as your charity. Bonus tip: Save the AmazonSmile link as a favorite and always shop from there.